Young Rembrandts teaches line by line drawing to elementary age students. 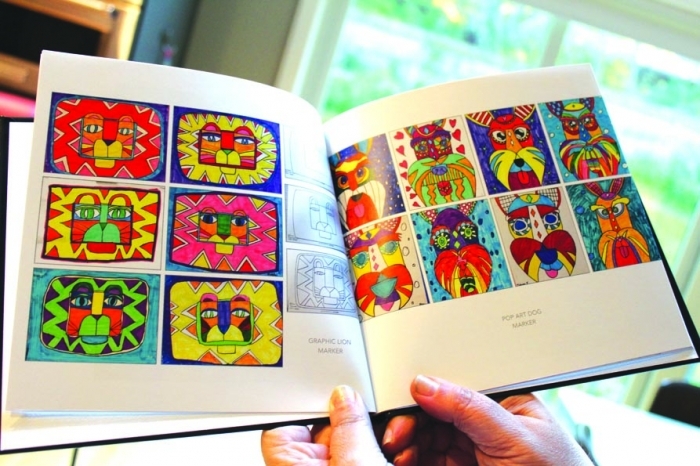 A book produced by Karen Brown, owner of Young Rembrandts of Greater Madison, features student artwork; Brown shows one of the lessons used in the program. MIDDLETON–Young artists can express themselves in an after-school program offered at elementary schools in Middleton, and around Dane County, as part of Young Rembrandts. The class teaches drawing with colored pencil and marker, crayons for the younger kids, and meets once a week, immediately after the end of the regular school day. The six-week class is available for preschool (3 1/2 to five years) and elementary (five to 12 years) students. 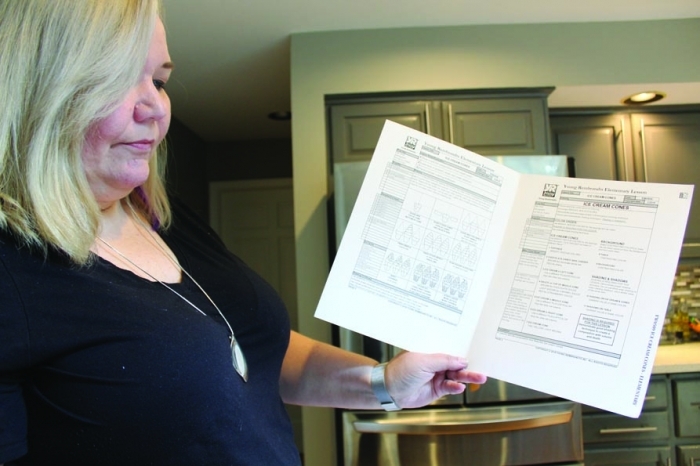 Brown started the classes in November 2017 after leaving a job she had held for 15 years. She has 12 teachers on staff and works with art teachers in the schools. Young Rembrandts has been around since the 1980s and was started in Chicago, IL, by Betty Fetter. Now there are over 100 franchises in North America and China. Betty still owns the company and her children work for her. She has a staff that creates the curriculum. “I wasn’t sure if the art teachers would be threatened, but I actually have art teachers that ask us to come in. They just can’t spend the time on developing skills.,” said Brown, who added that the classes also help kids outside the Young Rembrandts environment through changed perspective and behavior. The students create the drawings step by step and learn coloring, color order and color theory. Kids learn to do the foreground first and then fill in around it. In addition, the kids learn art history and sometimes a bit of general history. “My favorite part is I love seeing the kids at the beginning of class, they are like, ‘No Way! We can’t do that,’ when I show them the pictures, and then they complete it in one class,” Brown shared, and added that she always frames the artwork for the students. Brown said she also offered summer workshops that were five days long for three hours every day. One of their projects was a STEAM theme, which encompassed a new drawing representing each letter of the acronym, S-Science, T-Technology, E-Engineering, A-Art and M-Mathematics. For those who question the creativity of taking a step by step approach to art, Brown said, “If you sent your kid to music class, you want your kid to follow a curriculum.” A book she created of the student artwork at the end of last year supports this idea with multiple George Washington drawings, all very different in accordance to how the children viewed our first president. Young Rembrandts starts on Sept. 17 and Brown said the schools will distribute fliers with information about the classes. She said she can set up a payment plan and offers as many scholarships as possible. The classes average about $13 each, and Brown and her staff have classes in about 25 schools.